The Bible doesn’t directly mention a world inhabited by T. rex or an ice age where woolly mammoths and saber-tooth cats roamed, so some Christians believe these past “worlds” must be fiction invented by evolutionists. Other Christians see the piles of extinct creatures and assume they lived long before the garden of Eden 6,000 years ago, concluding that Genesis 1–11 isn’t literal history. But there’s another option which embraces both the present physical evidence and the factual history recorded in the Bible. The discovery of “lost worlds” opens up an exciting window into the past that gives us a better appreciation of God’s bigger plan for history and our place in his plan. Let’s consider just one test case, known as La Brea Tar Pits. Did you know that in downtown Los Angeles paleontologists are still digging up fossils from one of the world’s most famous ice age sites? Nobody even knew about the ice age until it was first proposed in 1824, and nobody recognized a distinct order of animals called dinosaurs until 1841. But the discovery of mass grave sites like La Brea gives us incredibly well-preserved snapshots of much different climates inhabited by species unlike anything we see today. It is hard to imagine, but 110 years ago there was no sprawling mega “City of Angels” (now the second largest city in the United States). There was just a small city surrounded by scrubby ranch lands! What sparked the explosive growth of Southern California’s population? Oil! Back in the early 1900s, instead of towering skyscrapers, the landscape was a sea of oil derricks tapping into the “black gold” deep underground. However, on one ranch the crude oil had seeped to the surface and collected in pools to produce “tar pits.” These were first reported in 1769 by Spanish explorer Gaspar de Portolá. In the late 1860s and early 1870s, the ranch owner was selling this natural asphalt for paving roads and waterproofing houses. The owner, Major Henry Hancock, had been collecting bones and teeth on his ranch for years. The existence of skeletal remains was first publicly reported in 1875, but everyone assumed they were modern animals. Then in the early 1900s geologists realized these fossils belonged to extinct species, and sporadic collecting began. In 1913 Hancock’s son granted the Natural History Museum of Los Angeles County excavation rights for two years, and it collected some 750,000 specimens from 96 sites. Later the family granted the 23 acres with tar pits to the county, allowing systematic scientific investigation ever since. The official name of this research park, “La Brea Tar Pits,” is actually “doublespeak” because la brea is Spanish for “the tar.” So it’s the “Tar Tar Pits.” These pits have preserved a remarkable time capsule showing what the area was like back in the post-flood ice age. When did the “tar” pits form? The geologic evidence indicates the pits didn’t form until long after the global flood, so the creatures must have lived after the flood too. How do we know that? Several events had to take place in sequence. About 1,000 feet (300 m) beneath the park lies what is known as the Salt Lake Oil Field. This pool of oil is stored in sandy layers deposited across the Los Angeles Basin. But the oil didn’t originate there. Marine algae buried in mudstone deeper down first had to produce the oil. Then the oil had to migrate up to be stored in the sandy beds. Earth movements then pushed the sand layers upward into an arch, helping to pond the oil into this pool. Next, the moving earth also caused a fault to form at the crest of the arch, known as the Sixth Street Fault. (Yes, La Brea is located on Sixth Street.) Afterward, sometime during the rapid post-flood ice age (Pleistocene), glacial water then deposited about 200 feet (61 m) of alluvium (silt and clay) over this entire area, sealing all the layers below. But we don’t have tar pits yet! Earthquakes, which have made Southern California infamous, eventually opened fractures in the alluvium, enabling crude oil to leak up to the surface, where it collected in pools. There methane and other gases bubbled off. The lighter petroleum evaporated or biodegraded, leaving a heavier, bituminous residue. Strictly speaking it is not tar, which is a man-made product, but natural asphalt. It’s very sticky. This sticky death-trap arose quite recently, after a long series of geologic events late in the rapid post-flood ice age (after the ice age alluvium was deposited!). 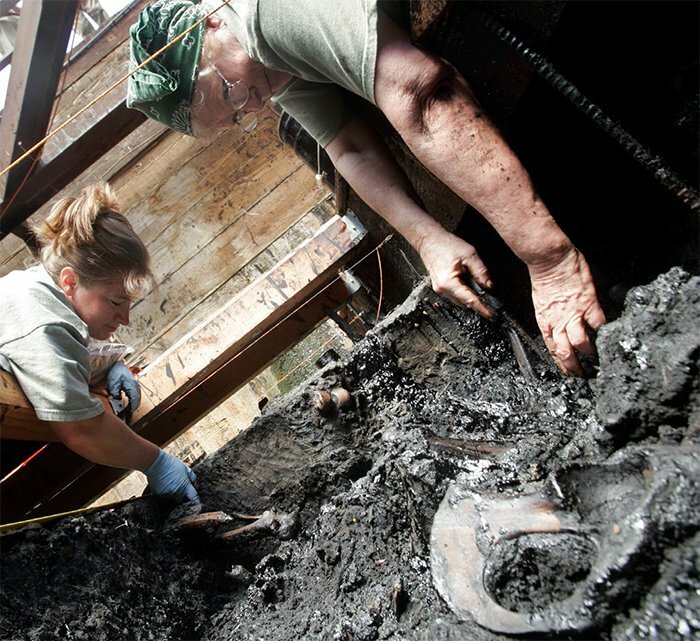 Volunteers clean bones found in the La Brea Tar Pits in Los Angeles. Scientists at La Brea have consistently uncovered new clues about the ice age since systematic digging began in 1913. Such pools, with their watery sheen, looked innocently inviting to animals. Leaves and other plant debris blew in and covered their surfaces, while insects hovered over them. But woe to any animal that ventured into the tar! Once the first herbivore or insect-eater got trapped in the tar, the carnivores would sense a “free meal” but become trapped in the sticky tar themselves. Even birds quickly became victims. Once a victim was engulfed, the tar acted like a preservative. Natural decay and scavengers ate away the flesh, leaving skulls, teeth, and bones. But the sticky chemistry preserved the bones so well that they remain practically unchanged from their original state, with up to 80% of the original bone fiber (collagen) still in them. The tar got into everything, even in the remote sinuses of skulls and marrow cavities of bones. Apart from the black or brown color, the bones look the same as their modern counterparts. No wonder the original ranch hands thought the bones came from modern coyotes, wolves, and livestock! With the help of this preserved “world,” scientists are reconstructing what life was like late in the ice age. The fossil teeth retain evidence of wear that reveals details about their varied diet. Some teeth even contain fossilized plant fragments that document what the animal had eaten just before it died. Limb bones appear with adjacent bones so we can see how they fitted together in life, and the details are so well preserved that it is possible to discern the courses of nerves and blood vessels, as well as places where tendons and ligaments attached. Diseased, injured, and healed bones and teeth tell us about their struggles in an “alien” world, which actually wasn’t all that long ago. So far, around 600 species have been found in the pits, including 60 mammal species. Even a quick perusal of the list shows an assemblage much different from anything you’d find today. It includes creatures no longer native to our hemisphere, including two species of elephants (mammoths and mastodons), camels, and western horses (which were extinct by the time the Conquistadors arrived with their European horses in the sixteenth century). Other extinct animals are closely associated with the ice age, such as saber-toothed cats, dire wolves, ground sloths, and the condor-like teratorns, which were even bigger than modern condors. Historical records report that some species, including all the identified snake species (at least 16), have lived in the Los Angeles area in the past, even if not observed there today. Fossilized amphibians, including toads, frogs, and a species of salamander, are still found in the area today. Most of the fossilized land snails are still found in California today, living at elevations between 4,000 and 10,000 feet (1200–3000 m) in the cooler, moister climates. What can we learn from this? Clearly, these creatures lived not long ago, but the climate in the Los Angeles area was then much cooler and wetter. The insect fossils tell us another story. Most of the insect fossils were recovered from the brain cavities of larger vertebrate skulls. This suggests the carcasses decomposed slowly over months, which indicates this was not during the catastrophic one-year flood of Noah. Characteristically, blowflies and flesh flies appear soon after the animal dies, followed by various beetles, as we find in the skulls. Was This Before Humans Arrived? None of the deep layers of fossil deposits have human remains. But near the surface, portions of a human skull and associated skeleton were found in one tar pit in 1914, at a depth of 6–10 feet (2–3 m). The bones were determined to belong to one individual. So it is clear that humans had spread from Babel to this part of the New World around the end of the ice age. Structural features of the skull are not unlike those of the aboriginal people who lived on the nearby Channel Islands and the coastal areas of Southern California prior to the arrival of European explorers. From forensic examination, scientists concluded that these remains were those of a female who stood about 4 feet 8 inches (1.4 m) tall. There is disagreement over her age at death. One study determined that she was between 25 and 30 years old, while a later study estimated only 17 to 18 years. What can we learn about her world? Some early investigators concluded that she got trapped there by accident. However, later researchers noticed that her cranium had traumatic lesions caused by blows from a grinding stone, which was buried very close by. This suggests she was LA’s first documented homicide victim. Another investigator disagreed, noting that the grinding stone appeared to be ceremonially defaced. He also pointed to shell and stone artifacts and the skull of a small domestic dog, which are evidence of secondary reburial. Such disagreeing interpretations remind us not to be too dogmatic when interpreting the past based on so few incomplete clues. Investigators have also found scattered human artifacts, most notably three broken darts and the wooden blunt foreshaft for an atlatl dart. An atlatl was a device for throwing a dart or spear. Thus, an atlatl-using people once inhabited Southern California, likely contemporaneously with the now extinct animals. Fossil bones found with cut marks indicate that the earliest human inhabitants used those darts to hunt and kill some of the large mammals. These findings are important because radiocarbon dating the wood helps us cross-check the radiometric dates for the human remains. Keep in mind that the evolutionary assumptions behind all radiometric methods result in hugely inflated dates in the unobserved past that are inconsistent with the eyewitness biblical account of earth history. The skeleton of “La Brea Woman” radiocarbon dated at 9,000 ±80 years BP (before present), while one of the broken wooden atlatl dart foreshafts dated at 4,450 years. Collagen from various animal bones has yielded dates of 11,000 to 36,000 years. Comparing samples of wood in the same tar pit indicated that the lower levels yielded an average age of 38,000 years, while fossil wood in the upper levels yielded an average of 13,500 years. What does all this mean? By no means are these correct absolute ages, because radiocarbon ages beyond about 1000 BC don’t match historically confirmed dates and they contradict the biblical timeline. Furthermore, radiocarbon dating of pre-flood vegetation (in coal) yields dates up to 48,500 years, not 300 million years as evolutionists maintain. Their absolute dates must be wrong. Yet relative dates can have value. Fossils further down in the ground consistently yield older radiocarbon dates than fossils near the surface. These dates are consistent with the end of the recent ice age, and even evolutionists would agree. It is obvious these remains are very recent because they sit on the present land surface and the tar is still oozing onto it. From a biblical perspective, the sediments of the Los Angeles Basin likely accumulated very soon after the flood cataclysm ended about 4,350 years ago. This also means the oil formed quickly after these sediments were deposited. This sequence fits well with the young-earth creationist model for the cause of the ice age. Volcanic activity warmed the ocean waters during the flood, and volcanic dust in the atmosphere set up the necessary conditions for a cycle of heavy precipitation and cooling temperatures. Snow accumulated rapidly in high latitudes and altitudes to produce ice sheets and glaciers. As ocean water was piled into ice on the continents, sea level dropped, exposing a land bridge between Asia (Siberia) and North America (Alaska). Animals migrating from the ark were able to cross from Asia into North America. Some eventually arrived in the Los Angeles area. Because of their scattering from Babel, people followed the same path, seeking suitable places to settle. As various kinds of animals migrated from Noah’s ark, they bred different varieties (now called species). Where varieties were suited to different and changing environments, they settled. So the varieties that eventually arrived in the Los Angeles area looked different from their ancestral on-the-ark counterparts. This variation within God’s created kinds has continued to this day, so many of the extinct species that were fossilized in the tar pits look different from the creatures that live in the area today. It’s part of God’s plan for animals to fill the earth and survive its ongoing climate changes. What Was the Environment Like? As a rule, plants give us an excellent indication of past climate. The types of plants that grow in a particular region closely reflect its temperature and humidity. Thousands of years ago, when these fossils formed in the tar pits, the region had at least four types of environments that are not the same as today. Some of the plants, such as coastal redwoods and dogwoods, are now found only well to the north. Other kinds of plants, such as sycamore and raspberry, are now found lining mountain streams. 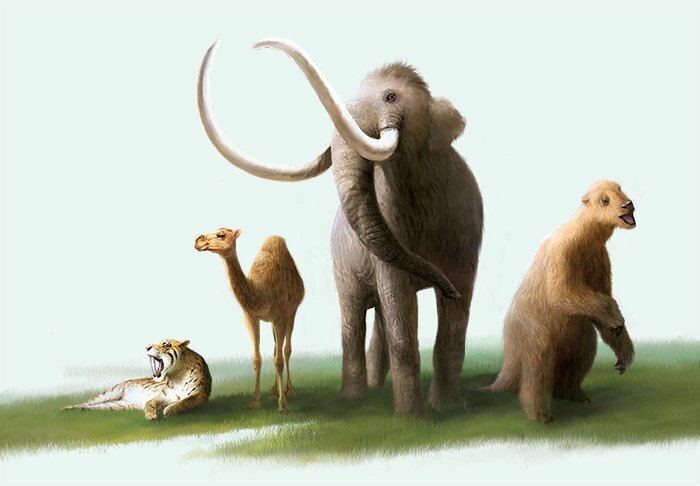 The moist climate and wooded habitat in the Los Angeles area at the end of the ice age was conducive to supporting herds of large animals such as mammoths, bison, ground sloths, and horses. So the tar pits give us clues to reconstructing the “lost world” of a whole biological community, with cooler and moister weather, hinting at the interaction of a thriving web of plants and animals. It’s intriguing that so many of the species buried in the La Brea Tar Pits are different from those we find living in the Los Angeles region today. Clearly, they lived in different climate conditions, and the evidence indicates that this climate predominated at the end of the post-flood ice age, about 4,000 years ago. Adding to the intrigue, those creatures had specialized traits for the cold, which gave them advantages for their climate and made them look different from other varieties that descended from the original families that left the ark and spread over the earth. Our Creator God knew what they would have to face in the early post-flood world, as the earth recovered from the flood upheaval. So he provided them with the designs and DNA needed to breed different varieties to adapt quickly to those changing conditions and obey his command to fill the earth again. What a lesson about God’s plan for us today! “O Lord, our Lord, how majestic is your name in all the earth!” (Psalm 8:9). The same wise Creator who provided for those ark creatures as they diversified and spread out to inhabit the postflood world—and who clothed the lilies of the fields—is our heavenly Father who promises to care for us. Saber-toothed cats are one of the most iconic ice age creatures. Their fossils appear in abundance at La Brea, indicating they thought the tar pits were an inviting hunting ground but found they were a deadly trap. Camels once roamed North America, as we now know from the many fossils at La Brea. They thrived on the prairie grasses that were common during the ice age in the cool, moist areas south of the ice sheets. It wouldn’t be an ice age without mammoths. Columbian mammoths, taller and heavier than their modern counterparts (the Asian elephants), once called California their home. Their immense size helped them keep warm. Elephants weren’t the only mammals that got really big during the ice age. Giant ground sloths reached 10 feet (3 m) tall and weighed up to 1,000 pounds (455 kg). These sloths, now extinct, walked on all fours and stood on their hind feet to strip leaves from the tops of trees. Dr. Andrew A. Snelling holds a PhD in geology from the University of Sydney and has worked as a consultant research geologist in both Australia and the US. Author of numerous scientific articles, Dr. Snelling is now director of research at Answers in Genesis–US.